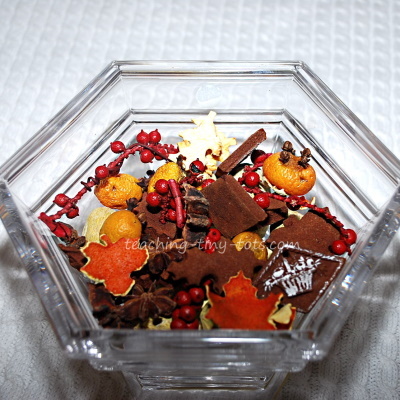 Toddler Activities: Cinnamon smelling potpourri with tangerine peels and kumquats make this a beautiful Fall or Christmas decoration. Add this with some fragrant orange peels, pine cones and cloves to make your own holiday potpourri. Follow Cinnamon Dough Recipe and roll out onto wax paper or parchment paper. Roll until it is about 1/4 inch thick. 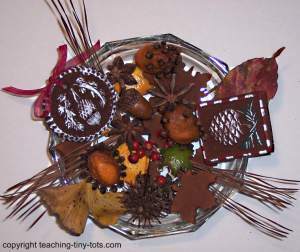 Cut out your cinnamon potpourri pieces using cookie cutters or molds. Bake 175-200 degrees F for about one hour turning every 15 minutes or let air dry for a couple days. Press metal cookie cutters into tangerine peels. Make holes in kumquats with a toothpick, this will allow for the whole cloves to be inserted easily. Press 3-5 cloves into kumquats. When cinnamon pieces are dry arrange it all in a small vase or bowl. Change cutters according to holiday/season. Cloves are a preservative and the fruit may turn brown where they are place but that is part of the drying process. Pour into a small lacy bag, tie with ribbon for a sachet. Have child close eyes and see if they can identify the different smells.